Fitness (PNF) the trainers know this, and they strive to make you comfortable once you are through the door. “When people first come in through the door they have done the hardest part”, states Mark York, co-owner of the Windham based fitness business. “Our goal is that once people are here, they will see that we have something for everyone and work to make them comfortable”, says Mark. PNF has recently changed locations, according to Whitney Sullivan, co-owner, “The only change is our awesome new location”. The new location has similar amenities to the previous location, with a “slam wall”, indoor turf area, and floor area with mirrors, but this new space has more to offer including outdoor turf, TRX suspension, restroom with a shower, and more parking. Whitney explains that they are excited about their outdoor options as well, “It’s always nice to take training outside on a beautiful day”. This space lends itself to a variety of classes and training options. PNF hosts six classes a day that offer a variety to our local population. These classes range from Youth Fitness, spinning, TRX classes, Silver and Fit and more. “We love being able to offer a variety of classes, because health and fitness isn’t just for one population, it’s for everyone”, shares Mark. This is evident in the Youth Fitness class offered at the facility on Mondays and Wednesdays. This class offers youth from 7 to 12 years of age a chance to be active year round, an often includes fun and motivating games that keep the youth interested and active. On the other end of the spectrum, the Silver and Fit class is geared towards participants 55 years and over. “This class provides many modes of exercise using weights, rubber bands, and incorporates balance to help our seniors with their activities of daily living”, Whitney reveals, “all while listening to music and socializing”. Mark adds, “It’s a special group, they have been together exercising for years and have all grown to know and care about each other, we are proud to be part of it”. 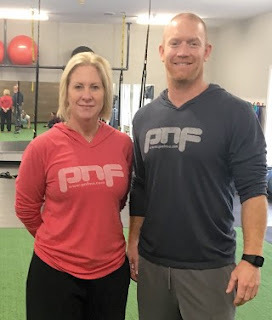 PNF also offers personalized training with one-on-one sessions and small group sessions. This allows for the trainer to focus the workout to meet the needs of the client. “It’s not uncommon for people to have a sore back, shoulders, knees, etc. So when we work one-on-one with clients we can focus on their needs to make sure everything is done safely”, Mark states, “People’s goals and reasons for working out can be different, we are able to personalize their workout to help meet these goals”. Whitney adds, “We also offer a wide range of nutrition programs that help our client’s meet their goals and special needs, we become invested in our client’s health and want to give them the tools to be successful”. Whitney and Mark have been training in Windham for a combined total of over twenty years. It is clear that they have a passion for health and fitness. “We have seven trainers that work here with us, and it’s important for us not only do they know the science for this, but they are approachable and invested in our clients,” Whitney shares. “All of our trainers have a Bachelor’s degree in health-related fields; they are very knowledgeable and like to stay on the cutting edge of fitness”. “We hope that when people come in, they are comfortable, that they can work towards their goals, and have fun doing this” the two owners agree. 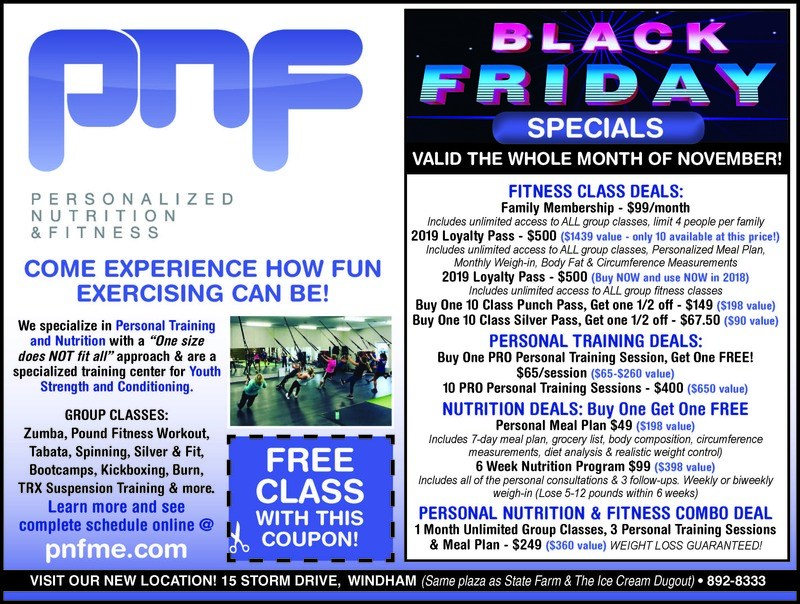 Mark and Whitney invite you to come see their new location at 15 Storm Drive, Windham and experience PNF for yourself with the coupon for a free class in the ad below. For more information visit their website at www.pnfme.com or call 207-892-8333. You can also find them on Facebook.